I love using new stuff. Pautzke sent me the new Fire Balls in the fall and I was blown away with how good they looked, but needed to make sure the salmon and steelhead liked them, too. I was tipping my jigs with them while salmon fishing and catching fish. I was also tipping my shrimp and egg baits with them during salmon season. 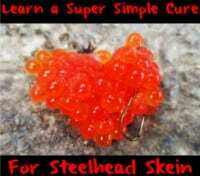 The real test came once steelhead starting coming in because I could compare them to the success we’ve had with beads. I’ve kept the Fire Balls on the down-low for a few months while I tested them. In fact, only my clients and a few guide buddies knew I had them. I haven’t felt comfortable enough to talk about them because I wanted to thoroughly test them for a few months first. I needed to know they work as well as they look. The first time I tested them I used Pink Shrimp Fire Balls. I was fishing a large coastal river and tied them in sacks. I was putting nine to 10 Fire Balls in a sack and fishing dirty water on a day we were also running yarnies with a bead. Yarnies and a bead is a common high water setup I use. The bead was a 14 mm pink bead that is my go-to bead under a yarnie (a yarnie with a bead dropper). I caught two on the bead set up and then switched to Fire Balls and landed five more. That pink bead has been my go-to bead in high water for the last few years. Fire Balls fished in sacks is out-fishing it. The funny thing is my clients (who we first tried these with) have always caught their fish on beads in these conditions and were putting the Fire Balls out there instead. My clients will tell you they work. Fire Balls in a sack is different than what many guys on the West Coast are used to. Actually, I think Pautzke designed these for trout, but they know how much I like to play with new product so they sent me samples anyway. I’ve found many ways to incorporate it into my daily routine, but we are going to focus on spawn sacks here. With a traditional spawn sack (one with real eggs) you are losing color and size after several drifts. However, Fire Balls are the opposite. After about 25 minutes of bobber dogging they start to expand, which is no big deal. The Fire Balls hold their color and scent extremely well until that point. As soon as they expand too much we replace the sack, which is the same thing you’d do with a real sack anyway. I’ve been running Fire Balls every day for a while. And, they’ve been working. I’m still using my regular baits, but adding this to the arsenal. I think they look cool. My clients think they look cool. And, it’s something different. 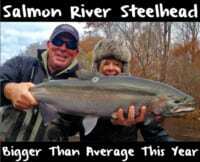 The steelhead see tons of beads and a lot of times they are hitting something different. These Fire Balls are different. And, they work. I’ve used all the rubber eggs and beads on the market and there’s nothing like Fire Balls. Fire Balls are seemingly translucent and I like it. I think they look really good in the water and the fish have been biting them. They seem to be more durable than a regular spawn sack and they are way less messy. I’ll be honest I think these work just a good as real eggs. And, so many anglers struggle to get good eggs that the Fire Balls are a good substitute and always available. As with everything I do I’ve put Fire Balls on my own program. One of the things I’ve been doing is adding a Puff Ball to the sack and also adding real eggs to them. For example, in some of the sacks I’ll have five Fire Balls and a few Gold Label in it for added scent. Here’s what I’ve come up with for the number of Fire Balls I’m putting in a sack. In big water 8-10 eggs, medium water 5-6 and low water 3-4. I have 11 different colors sitting in my garage right now, but have only used three religiously so far. I think they will all work, but I’ve grown attached to a few of them. I like Pink Shrimp in dirty water, the red in the medium color and Orange Shrimp in the super clear water. Editor’s Note: Big Dave Manners operates Wilson River Lodge on the Oregon Coast and Big Dave’s Fishing in Alaska. He’s been featured on dozens of TV and radio shows and in nearly every fishing magazine in the West. For more info on his guided trips please visit http://bigdavesfishing.com.